SCVHistory.com | California Governors | (Acton Gold Mine Owner) Henry T. Gage's Inaugural Address, 1-4-1899. 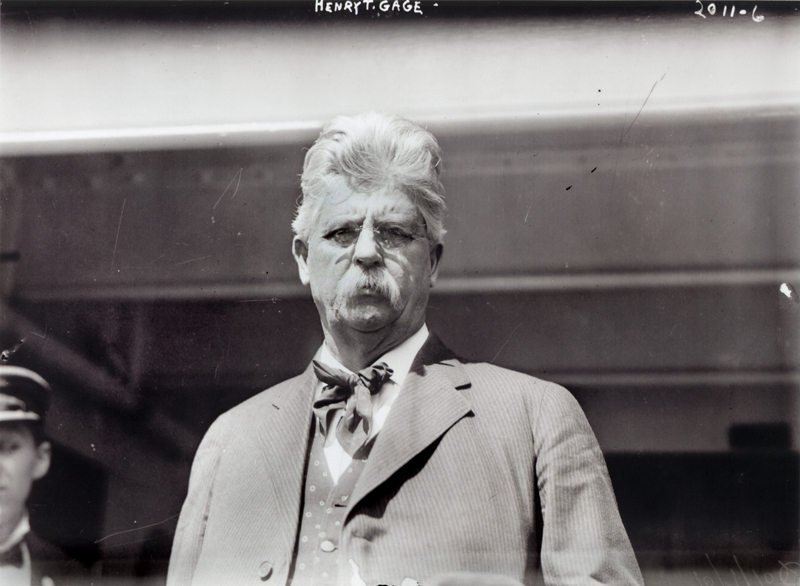 Webmaster's note: Henry T. Gage (1852-1924), a Republican, owned the richest gold mines in Los Angeles County — they were in Acton — when in 1898 he defeated Democratic U.S. Rep. James G. Maguire and two minor-party candidates (a Socialist and a Prohibitionist) in the race for California governor. To faithfully fulfill the solemn duties imposed on me by the official oath just administered is my unalterable purpose. Individuals are, at best, but weak instruments to guide the destiny of a State. Conscious of this truth, and being fully aware of the grave responsibilities incident to this sacred trust of office now imposed upon me, in order that I may be rightly guided in my public duties, I humbly repose my faith in that Omniscient Power which alike directs the course of nations as individuals. Our country has just emerged from a foreign war. Springing from the highest and noblest motives, the war, through the gallantry of American soldiers and sailors, and the grand policy of the National Administration, has been waged to a victorious end. While we deeply mourn our heroes who died in that great cause, we know that their deaths were not in vain. History will be tender to their memory; our flag will more proudly wave above the soil that shelters them; our country will enshrine their marvelous deeds. As a result of that contest, Spain, crippled and bankrupt, pays its debt to America by the cession of territory. The peaceful acquisition of the Hawaiian Islands, extending our empire beyond our Pacific shore, should be followed as a political necessity by the annexation of the Philippines. The center of commerce must move westward. California, favorably situated, will, among other advantages, reap the harvest of trade with these new territories, developing our many varied and growing resources, creating a western merchant marine for the carriage of our imports and exports, and luring to our markets the nations of the world. The Nicaragua Canal, soon to be opened under the fostering care of America, will give us a short eastern outlet, and the great feat of our ocean fortress, the Oregon, will never again be a necessity. Under these promising prospects the Philippines must be retained. No short-sighted policy should yield the land crimsoned with American blood. The construction of the Trans-Siberian Railway will bring the wealth of Russia to our shores. Australia, Japan, China, Asia, and Africa will be bound to us by the golden cords of commerce. Within sight of such a future, we, ourselves, must assist in the development of this State. We must be neither niggardly nor extravagant. Parsimony in governmental affairs is as dangerous as extravagance. The year 1900 will usher in a great commercial theater — the Paris Exposition. It has been suggested that some appropriation for this great event should be granted, in order that California may be properly represented in the exposition. If this matter is to receive legislative consideration at all, since our Legislature meets only every two years, the propriety and expediency of an appropriation for this purpose should be disposed of at this legislative session, for it would be too burdensome upon the people to call hereafter an extra session to deliberate upon this subject. The question of such an appropriation is respectfully submitted to your consideration, to take such action in the premises as you deem advisable. If any appropriation should, in you judgment, be allowed, it ought not be so large or unreasonable as to become onerous to the taxpayers; nor, in legislating upon this subject, should you provide for numerous high-salaried officers, with a long retinue of salaried attendants, whose traveling and other expenses would squander the public money. If you should determine in favor of an appropriation for the payment of the expenses of a commission to represent California at the exposition, it will certainly be necessary to practice economy in other directions, so as to reduce the State's expenses elsewhere in an amount equal to the sum so appropriated, if any, because the general rate of taxation must not be raised in consequence of such an expenditure. Complaints have not been infrequent respecting the cost of administering the public business of the State, and comparison is sometimes made with our own as to the cost of conducting the governments of other States. While these complaints are not altogether unfounded, yet the comparison itself is unfair. This State, territorially speaking, is of vast proportions, being in width 300 miles, in length over 800 miles, and skirting almost the entire western boundary of the United States. Having so extensive an area, so diverse a climate, and so great a variety of agricultural, horticultural, and mineral resources, we should not expect to find the expense of governing this State no greater than that of other States of less territorial extent and fewer resources. The great extent of our State, its wonderful resources, the number of official departments and the important provisions in our Constitution and laws have heretofore afforded opportunity for waste and prodigality in the conduct of the government, to which my distinguished predecessors in office have often, but vainly, call attention. In my opinion, among other things, we suffer much from over-legislation. The best laws are not usually the most complex. The aim and art of government is to attain simplicity. The best governed State has the fewest laws, and the wisdom of legislators may sometimes be shown to the advantage of the public weal by refraining from legislation. If our Constitution were amended so that our legislative sessions should be held every four instead of two years, the people would derive much benefit and a more stable and economic government would follow. Scarcely have our courts, after expensive litigation, construed and interpreted the acts of a preceding legislative session, when the same laws are amended or changed by a subsequent Legislature. Were our lawmakers to spend more time in repealing than in enacting surplus statutes, the public interest would be better subserved. Already we have too many State boards and commissions, with extensive lists of subordinate employés, drawing larger pay than could be earned by them for similar services within the lines of private business, and this should be corrected. It has sometimes happened in previous Legislatures (and I trust no such instance will here occur) that Senators and Assemblymen have pledged themselves to secure appropriations for the public institutions situated in their particular districts, without a thorough investigation of the immediate needs of such institutions. This system is not only unwise, but not warranted by good governmental policy. Each fund should remain intact, to be devoted to the special purposes authorized by law. The State, as well as each The State Printing Office, having been by my predecessor denied certain appropriations, has been closed, and the additional expense consequent upon reopening it will be shifted from the outgoing to the present administration. While this is an essential department of the government, through some unfortunate circumstances it has been a source of much waste. In thus expressing my view I do not here intend to reflect upon the ability and integrity of the distinguished incumbent. The fault lies elsewhere, and will require legislative remedy. Chief among the causes of this extravagance is the unlimited power allowed the various public State officers of ordering, at will, the printing of books and documents for their several departments. The expense of such printing, which should properly be charged against the account of the officers of the departments and institutions ordering the printing, is unjustly arrayed against the State Printer's account. Some proper check should be imposed upon the expense of printing incurred by the various officers, boards, and departments. Each public institution and office should be charged for its printing out of its separate appropriation or fund on hand. The door of the State Printing Office is too ready of access to public officers. It should be remembered that public money is a trust fund, which public officers are obligated by their oaths to protect from waste. Again, too many copies of public books and documents are printed, many of which are distributed throughout the State to persons who neither read nor use them. Added to this is the unnecessarily voluminous character of the reports presented by public officers. I find that conciseness is a rare rhetorical beauty in official reports. Another source of great expense which may be corrected by proper legislation is the printing of school books. It should be the aim of our Government to assist free education by supplying, if possible, free school books to the children of the public schools. Until such object can be economically attained, the printing of school books under the present system of selling them at cost price should be made self-sustaining, instead of requiring new appropriations therefor to be made at every session of the Legislature. This was the theory of the present law, and seems not to have been accomplished. It has sometimes happened that certain public officers, desirous of increasing the grandeur of the particular public institutions under their charge, have gratified their desires by erecting unnecessary palatial structures, and indulged in accompanying extravagances. This misuse of the public money should not be tolerated, but only reasonable buildings, additions, and repairs allowed. The money of the State should be limited to the State's necessities—and splendor is never a State necessity. Legislation should be directed to the end that all money received by all public officers, boards, and commissions should be deposited in the State Treasury, which, in some instances, I understand, is not now the case. All claims and demand should be audited by the State Board of Examiners and drawn out on warrants of the Controller, as is usual in other public accounts. Such a method would be a check upon wanton expenditures, and a vast benefit to the State. This matter has been referred to in the last report of the Controller, and is worthy of your serious consideration. With each new administration there is a revival of stale claims which former Governors have vetoed or former Legislatures disapproved. Strenuous efforts have been made to lobby through each new Legislature the bills which have failed to pass each preceding session of the Legislature. The spirit of lobbying is too prevalent, and should be checked. It fosters a corrupt sentiment that it is lawful to rob the State. Some people who are scrupulously conscientious in their private dealings with one another, actuated by this spirit, do not hesitate to demand improper or excessive appropriations, or to attempt to secure the approval of dishonest claims. The interests of the State should be the interests of every citizen. The money of the State is as sacred in ownership as the money of the individual. Although the Act providing for bounties for coyote scalps has long since been repealed, claims aggregating $287,615 are likely again to be presented at this session of the Legislature. In the second biennial message of Governor Markham, January 7, 1895, attention was called to the fact that the State had been "shamefully defrauded by the payment for scalps that had been shipped into the State from Oregon, Nevada, Arizona, and Mexico." "I am convinced that frauds have been perpetrated on the people in the presentation and manipulation of these claims in several of the counties of the State, and while the claims from many of the counties of the State are undoubtedly just, if the Board of Examiners be given the above power, and false swearing thereunder be made perjury, I am confident that there will be effected a large saving of money to the State." "I have again included in my estimate the amount due to creditors of the State for bounty on coyote scalps. The greater part of these are legitimate claims, and the State is morally and legally responsible for their payment. I have no doubt there are among them many that are fraudulent, but these may be segregated from the honest claims, and the latter should be paid without further delay." From the foregoing reports it will be observed that these claims, amounting to $287,615, are, as a whole, tainted with fraud, and the honest claims, if any, are not segregated from the dishonest demands, and should be segregated before any appropriations therefor be made. The holders of these claims must not expect from me more leniency than they have received from my predecessors. I trust that you will closely scrutinize these claims before allowing any appropriation whatsoever. It is my inflexible resolve to oppose all unjust and excessive appropriations, as well as all other improper measures, with a firm veto. It may not be out of place here to call attention to the exorbitant cost of our elections, by referring, among other matters, to the single item of advertising constitutional amendments. Although the newspapers of the State, as public censors, have usually been valuable assistants in urging economy in the administration of government, yet some of them appear to overlook this matter when presenting their own claims against the State. Self-interest is often morally blind. Newspaper claims (some unauthorized) aggregating over $60,000 have been presented against the state for the mere publication of the constitutional amendments voted upon at the last election. When the newspaper proprietors now urging these claims properly reflect upon the matter, their good sense will, I think, suggest that even newspaper claims against the State may be excessive, and in that sense unjust. I have approximately estimated that the people of this State are taxed, under the present election system, at the rate of about $2.50 for every ballot cast and counted at each general election. It is astounding that such expense should go along for years unchallenged. If we are now to have a primary election law, such primary elections should, under no circumstances, be made a tax upon the people, as under the present general election system; otherwise it would largely increase the present extravagant tax burdens. Some immediate action should be taken to relieve the people of this State from the enormous expense of conducting elections, rather than increasing it. This administration is confronted by startling claims of various counties against the State, amounting to about $1,500,000, for commissions alleged to be due such counties from the State for collecting State taxes. Although these commissions were abolished by the Act of the Legislature, approved February 23, 1893, contracts have been made by these counties with attorneys to enforce the collection of such commissions. The spirit of the county officials which inspires these demands is neither patriotic nor business-like. The officers of the counties should remember that these suits, if successful, will "return to plague the inventor" in the form of increased taxation. The people of the State will be, moreover, ultimately compelled to pay through taxation whatever amounts may be expended by the several counties for the compensation of counsel and the payment of other expenses incident to the litigation ; and since the counties form a part of the State, it is clear that they will gain nothing by the litigation, but sustain a loss of whatever sums are paid in their attempts to collect these commissions. Furthermore, should these suits succeed, the State Treasury would be drained of the necessary money to pay its current expenses for at least six months, and until the receipt of money from the State taxes of the next fiscal year. One of the technical points raised by the ingenious counsel for the counties against the State is that the Act of February 23, 1893, last referred to, was not passed by a majority of twenty-one Senators. Assuming that the Supreme Court should decide that it could look behind the enrolled bill (which, however, should not be the law), my personal examination of the original roll-call shows that the Act in question was passed by the requisite vote, namely, of twenty-one Senators, but a mistake arose in the printing by the omission of the name of one Senator. This leads me to say that laws passed by the Legislature should be most carefully and closely examined in both Senate and Assembly before final action thereon, otherwise serious errors may arise, entailing expensive litigation, as in this instance, and, also, possibly jeopardizing public rights. The State Treasurer is obliged by law to pay all warrants of the Controller out of the funds drawn upon, and to report these payments to the Controller at the last of the month. Section 433, Subdivision 18, of the Political Code, specifying the duties of the Controller, requires him to furnish the State Treasurer with a list of warrants drawn upon the treasury. The language of the section is certainly ambiguous as to the time when this list should be furnished to the Treasurer; and I am informed that it has not been customary to issue such lists in advance of the presentation of the warrants. This is a very serious matter for the State Treasurer, as it would not be a difficult task for a forger to alter the face amount of these warrants, which are frequently assigned by the holder, and pass from hand to hand. The subdivision referred to should be amended so as to require the Controller to furnish the Treasurer with a list of the warrants and their amounts as soon as drawn, and in advance of their possible presentation. This will enable the State Treasurer to compare the warrants presented with the lists furnished by the Controller, and avoid all possible criminal frauds and impositions. The claims of California against the General Government for furnishing, equipping, and paying volunteers during the Civil War, aggregating over $4,000,000, are still unsettled. Various bills have been from time to time introduced in both the United States Senate and House of Representatives, but they have been either abandoned after introduction or referred to committees without final action taken thereon. On June 9, 1898, the United States Senate adopted a resolution in the matter of H.R. 4936 respecting these claims, and appointed three Senators, viz., Teller, Pascoe, and Stewart, to confer with the House of Representatives. A provision for the payment to this State of $3,951,915.42, in full settlement of California's claims, has been included in the Senate amendment. California cheerfully furnished to the Federal Government soldiers in defense of the Union, and, while the nation had the right to this support, it had no right to the money, amounting to over $4,000,000, which the State advanced for the equipment of its volunteers; and this money should now be restored to the State, with interest. Our Senators and Representatives in Congress should be requested to use every lawful effort for the passage of a bill allowing these war claims, for at least $3,951,915.42, the amount allowed in the Congressional bill to which reference has just been made. These war claims are both just and equitable, and the State has long and patiently waited for this settlement. The drought of last year again illustrated the great necessity of the storage of mountain waters and winter rains for irrigation purposed to meet the contingency of dry seasons. The expense of such an undertaking is so far beyond the means of the State, and the advantages are so great to the Federal Government for the irrigation, reclamation, and sale of its public arid lands within the State, that the money to be raised for such purposes properly falls within the domain of Congress. The construction of storage reservoirs would induce settlers to take up locations upon the public arid lands, enhancing, through settlement and cultivation, the value of such land, and adding largely to the population and wealth of the State and nation. Our Senators and Representatives in Congress should be requested to introduce a measure to secure Federal aid in this direction. Our State has not been materially benefited through the laws enacted in respect to irrigation districts under the Wright Act. Unfavorable results have followed the so-called Wright Act, burdening the land-owners, imposing additional taxes, and causing perplexing litigation. While some portions of the State have been favored through it, other parts have been injured. Bonds aggregating a large sum of money have been issued upon the doubtful securities afforded by several irrigation districts, and in many cases even the interest on these bonds has not been paid, so that the bonds themselves are practically unsalable. Some measures should be adopted which will prevent the continuance of such undesirable conditions, and put an end to the litigation and loss consequent upon this class of legislation. Notwithstanding the great ability and untiring energy of the learned Justices of our Supreme Court, and the Supreme Court Commissioners, experience has demonstrated that it is impossible for them to dispose of the fast accumulating legal business coming before them. I therefore recommend that an amendment to the Constitution be adopted for submission to the electors, establishing an intermediate appellate court, having the final jurisdiction of a large class of cases which now come within the jurisdiction of the present Supreme Court. It is not only essential that the cases submitted to our courts should be decided justly, but it is also indispensable that they be disposed of promptly; otherwise great injustice will be done to the people. While rigid economy should be practiced in all matters of State, yet useful public institutions should never be crippled by denying them reasonable and necessary appropriations, as seems to have been he case with the State Printing Office. It is required by Section 15, Article IV, of the Constitution of the State, that all bills, with the amendments thereto, shall be printed for the use of the members of the Legislature, before being put upon final passage. The State Printing Office (wherein these bills must be printed) is now and has been for some time closed, through the action of my predecessor. Hence, one of the first duties imposed upon this administration is to reopen the State Printing Office, in order to assist in carrying on the State and legislative business, as required by law; and it will be necessary at once to allow a reasonable appropriation, and no more, for this purpose. Some days, therefore, will elapse before the machinery of government will be in complete running order. Considering the official burdens thus early cast upon me, and the brief time necessary to acquaint myself with the details of the various offices, the absence of the printed reports of the State officers, as required by law, I will rely upon your assistance, as well as upon that of the several State officers, in placing the government upon a proper business basis. It has been impossible for me, with the means at my disposal, within the limited time allowed me before taking my oath of office, to make a very extended examination of State affairs; hence my references in this address to the few matters to which I have directed your attention are necessarily brief. As to other matters of state which may have been omitted, and which may hereafter call for legislative action, I will communicate by special messages my views thereon, as the occasion arises. While much rests with the Executive, grave labors devolve, likewise, upon you, in order that the happiness and prosperity of the people of this great State may be secured and augmented. Your patriotism and your sense of moral responsibility will guide you in your deliberations, and lighten the burdens of the Executive. The faithful administration of the public affairs of the State implies the individual as well as the public good. The money of the State is most securely guarded, and the rights of the people best preserved, when honor is placed above emolument, and self-love yields to love of country. Inspired with these motives, let us cooperate in the firm, brave, and honest discharge of our sacred official trusts.